Passion often times fuels innovation and creativity, particularly in the process of being able to relatably share personal feelings publicly with a growing nationwide audience. That’s certainly the case for San Antonio-based alternative-pop punk band, Finding September. The talented young musicians who make up the quartet, which is led by vocalist Emily Bayardo, thrive on their high-energy edge that powerfully helps them sharpen their expertise in chronicling the high and low points of adolescence. The singer and her instrumentalists thrive on their impressive five-track debut, ‘History,’ which is now available, by reflecting on the personal experiences they all had while writing and recording the songs, particularly about growing up. Finding September’s emotional journey of overcoming the obstacles that they’ve face in life so far immediately begins with ‘History’s initial entry, ‘Summer Club,’ which also served as the EP’s first single when it was released last May. 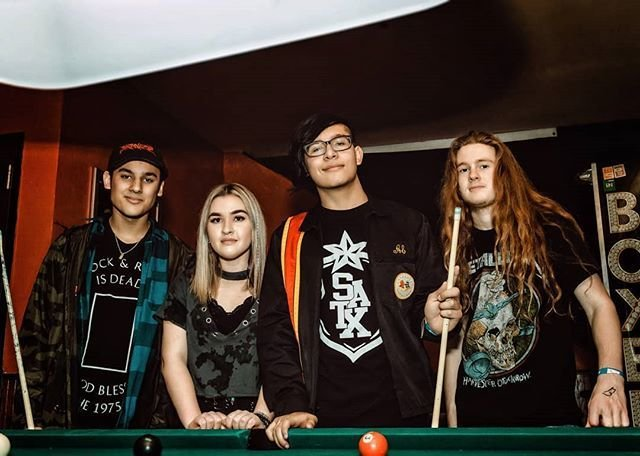 Listeners will instantly be drawn into the song’s hard-rock-punk drums and guitar, which are performed by band members Josh Gomez and Jayden Mermella, respectively. The instrumentalists’ relentless pace and attitude are driven in part by their solid rhythm, which is highlighted by bassist Graham Butler’s versatility. The instrumentation perfectly backs Bayardo’s rich, honest vocals that alluringly infuse R&B power-punk influences together. Driven in part by a ’90s dance vibe, the singer croons about how she and the person she loves made it on their own. She infuses an enthralling confidence in her pursuit of capturing what they want together. Bayardo’s charismatic wildness and visceral intensity, which rivals the vocals of Evanescence’s frontwoman, Amy Lee, continues on ‘History’s sophomore track, ‘Inhibitions.’ The tune, which has the energy to be one of the group’s best live performances, is driven by its amped up guitar. With the potential to rival hit pop-punk songs of the late ’90s and early ’00s, Finding September’s singer notes that nothing is holding her down to her relationship, which isn’t truly working. The inspirational anthem also features her strongly declaring that he won’t take a piece of her when he leaves, and she realizes that she now has to face things on her own. ‘Inhibitions’ then transitions into ‘History’s title track, which is one of the best songs on the EP. Bayardo infuses the tune with emotional vocals that reflect on their past, as she wonders how they got to such a conflicted point in their relationship. She has finally realized that history repeats itself, and the person she was involved with always leaves her feeling lost when he leaves. Since nothing has changed on its own, she has finally realized that she has to take charge of her own destiny, and initiate the adjustments she wants in her life on her own. ‘History’ then delves into the EP’s penultimate entry, ‘Darkest Greys,’ which is driven by brooding guitar riffs and drum beats. Finding September’s frontwoman makes the band’s listeners ponder reality, as she reflects on the dark days with the person she loves. She keeps him close to her heart, as she feels that they can find their way back to the better days they used to have, once they overcome the strain in their connection.